Sædís is a beautiful and sweet first prize chestnut mare. She has been extensively trained by some of the top Icelandic trainers/riders such as Sigurbjörn Bárðarson (“Diddi”), Gudmar Petursson, and Ísólfur Líndal Þórisson. All have pronounced Sædís an excellent riding and breeding horse. She has been successful not only in breeding evaluations, but in sport competitions as well. 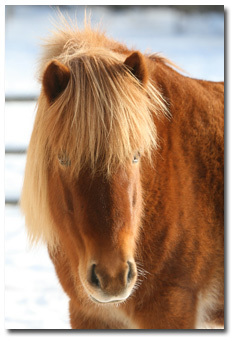 She has also participated in many major demonstrations of Icelandic horse in the US. To top it off she is also a successful broodmare. Sædís’ sire is Roði frá Múla. Roði obtained a first prize rating as a four gaited horse with limited showing. He is proving to be an excellent sire and has already obtained the prestigious title of first prize for offspring. From his sire, honor prize stallion Orri frá Þúfu - one of the top Icelandic stallions of all time, Roði passes along excellent supple tolt with much power. From his maternal grandsire Gustur frá Sauðárkróki, he gets an excellent neck, something that is often lacking in the Orri line. Sædís was lucky enough to inherit all the positives of the Orri line along with the long and supple neck of Gustur as well. 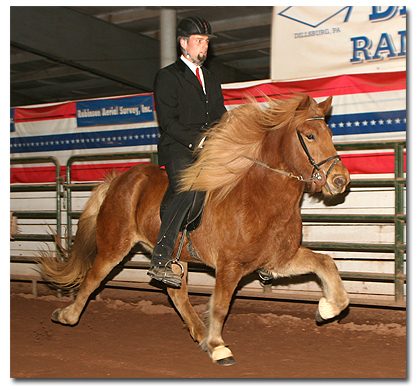 Sædís dam, Sveifla frá Bakka, is a second prize four gaited mare with excellent scores. She is a daughter of the famous honor prize stallion Hervar frá Sauðárkróki. We are big fans of the Hervar line and many of our horses over the years have had Hervar in their pedigrees. Though Sædís is genetically five gaited, she is what is often called in practical terms, a four and a half gaited horse. This means she has four excellent gaits and when ridden by an experienced rider can also show some flying pace. However, she is a natural tolter first and foremost with tolt as her favorite gait. Her tolt is extremely supple and she is able to perform it at all speeds with beautiful action and movements. Her other gaits are all also excellent. She has a very proud and regal look under saddle and enjoys working. She is fearless on the trail or in a large demonstrations. 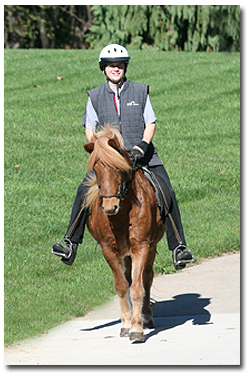 Although she is very flashy her gaits are smooth and comfortable and she is great fun out on the trails. One of the things that drew us to Sædís was her nice long, supple, and well raised neck. This is something that is very unusual to see in an Orri line horse where thick, short necks tend to be the norm. She is also well proportioned with long legs and a nice strong back. Her hooves are very strong and well formed and her mane and tail are long and flowing. She is as pretty standing in the pasture as she is under saddle. But what is most special about Sædís is her incredibly sweet character. She is a pleasure in every way and always tries her best to please. And not only does she have this awesome character, but without exception she passes it along to each of her foals. All her offspring have displayed the same sweetness and willingness from birth. We like to joke that it's as if they were born trained! Perfect for the American market. To view more photos and video of Sædís please visit her photo / video album. Sædís is confirmed pregnant to the great 1st prize five-gaited red dun pinto stallion, Sporður frá Bergi, for a 2019 foal!